I first came across, Chicago native (now full blooded New Yorker), Matana Roberts last year at a duo concert with Vijay Iyer. I was blown away and I've been waiting for new material ever since. Live In London (Central Control) is a work of compositional beauty. The album was culled together from performances at London's Vortex club. Roberts has surrounded herself with some great UK talent in Robert Mitchell, Tom Mason and Chris Vatalaro. This is group was put together specifically for this show but it feels like they have played together for years. The interaction between Roberts and Mitchell is truly astounding. Live In London opens with a epic piece (in length), "My Sistr", a very dark and melodic piece originally written by "alternative folk" artist, Frankie Sparo (real name: Chad Jones). 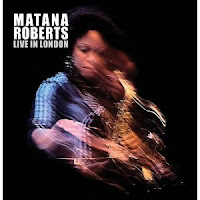 This version that demonstrates Matana Roberts as an artist that is constantly searching, improvising and improving with every note. It's a piece that travels a long way and is experimented with all along the journey. The original version carried an almost "My Funny Valentine" feel (if it were sung by Nick Cave). Roberts explores this beautiful through an emotional and inventive interaction with Mitchell and Mason. Mason sounds as if his bass is carrying the vocal parts while Roberts and Mitchell explore boundaries. 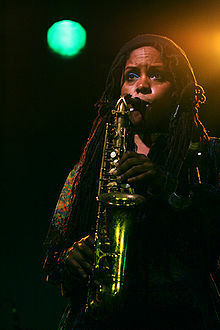 While earlier albums and sessions may have shown signs influences of Albert Ayler, Fred Anderson, Anthony Braxton and even John Coltrane, Matana has been working hard on her craft in the last few years. Live In London really shows sign of her underground voice burst upwards and becoming a real beacon to a new audience. "Pieces Of We" sees Roberts in full command. It's a track that opens fluidly with Roberts and Mitchell playing off each other beautifully. As the piece moves forward the tonality levels to an almost structural groove with some nimble movements from Mason. "Turn It Around" is an absorbing track with a mixture of blues, gospel and improvisation swirling throughout. Midway through Matana switches gears and it becomes an exploration of sound as she maneuvers through various phrasings. "Glass", for me, has shades of Ornette Coleman, but you can also hear Roberts exploring different themes all in the span of this 13 minute piece which goes by surprisingly quick. The album closes with "Exchange", a track from Matana's previous album, The Chicago Project. This version is drastically different from the more guitar-centric opener of The Chicago Project. Here we get a more measured and soulful aspect in its live incarnation. It has a wonderful balladry vibe to it and becomes a relaxing mood setter after a well traveled journey. Live In London delivers a very different vibe than its predecessor due to the accompanying musicians. While the tracks are different, the influence of Chicago and London also provide a very interesting contrast that makes listening to both records a must. Matana Roberts has grown and expanded her compositional skills and musicianship in the few short years since The Chicago Project. In May, Matana Roberts will release an ambitious cultural project, Coin Coin, which she has been working on for an extended period of time. Coin Coin should solidify her as one of the most promising new musicians on the scene. She continues to develop a unique voice that is resonating across both sides of the Atlantic. Matana Roberts should not be a considered an underground secret anymore. This is an artist who is determined to pushed jazz forward. It may tough listen for some of you but trust me, you will be happier for it.